GDP 20VX, GDP 25VX Mast details and capacity ratings (kg) - Superelastic tyres * With wide tread drive tyres (1321 mm width) or dual drive tyres (1601 mm width) - required for this rating. ** Dual Drive tyres (1601 mm width) - required for this rating. h2 & h4 are less loadbackrest. ♦ LWAZ, measured according to the test cycles and based on the weighting values contained in EN12053. 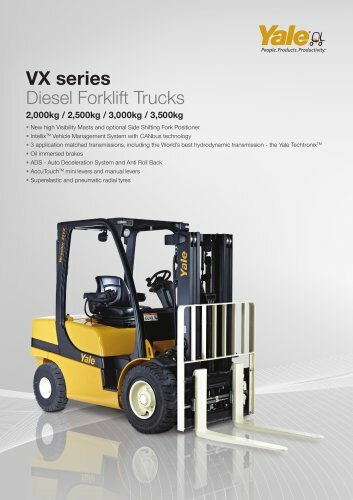 Base specification truck based on: Value and Productivity specification truck 1000mm forks and manual levers. top of forks 2 stage LFL Standard carriage, 1000mm forks and manual levers. Addition data C°mbusti°n Performance data Dimensions Tyres/chassis Weights Distinguishing mark For Value trucks fitted with manual levers, the values for lines 5.2 and 75 are as on the Base VDI table.